Long ago no one knew about websites and website hosting. But whereas today you can see that every business is using the website. Because before very fewer people were using the internet services but now everyone loves to use the internet service. And today if you are having a website then you would be knowing that what are the advantages that you are getting from it. Today most of the websites are build through WordPress because in WordPress you get best themes and plugins where you can use in your website and to work on WordPress hosting you no need to have special knowledge on the programming language. And today if you are looking for information on how to add the new category to the WordPress posts then here is the information on it. Listing the contents under the categories makes the search simple and forms a discipline in the content. In the WordPress, you can add and delete the categories and further you can post the posts under them. 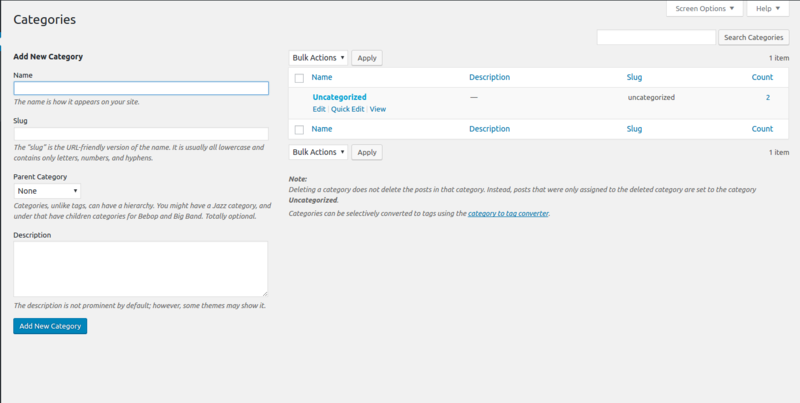 Consider the following simple steps add the new category in the WordPress admin panel. 1. Log in to the WordPress admin panel with the credentials. 2. Click on posts and navigate to categories. 3. You will be having a page to create a new category. category, Add the description for the category and click on Add new category. 5. The new category will be created and you can see the same on the page where it is listed. Are you looking to build and host your website on Wordpress? Then here at HostingRaja, we provide faster, secure and reliable Wordpress Hosting for our customers at an affordable hosting. And with our WordPress hosting, you can easily maintain and develop your website without any technical knowledge. Not only that we also provide amazing features with unbelievable offers and discounts with our WordPress hosting. So what are you waiting for? Get the best WordPress hosting from India's top WordPress hosting provider!